A few days ago we decided to make some garlic knots (the recipe for which will shortly be posted on Pocketful of Posies) and as I reached up to my shelf to pull down some garlic I felt something strange. 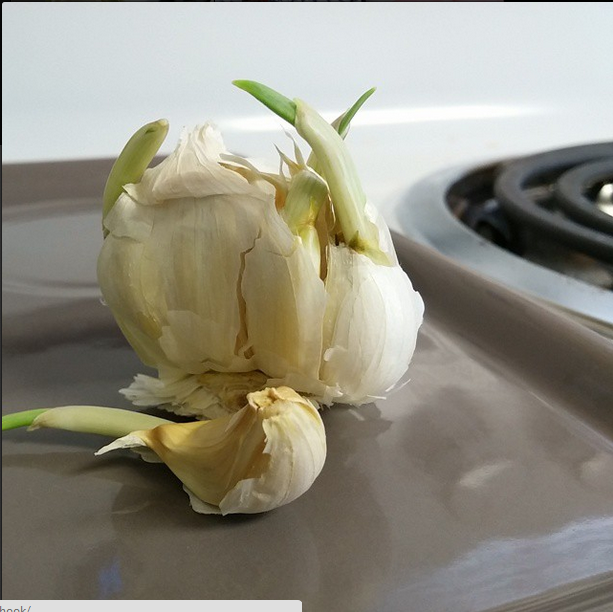 I brought down the bulb and upon inspection found five or six long green shoots sprouting from my store bought garlic. Now this garlic is still perfectly edible and delicious but for me it’s an excellent opportunity to test my gardening skills a little early. To plant garlic all you need to do is carefully break apart and plant the individual cloves, leaving the skin as intact as possible. From what I’ve read garlic is best to plant in the fall but this will be staying in my kitchen anyway so we’ll just have to wait and see what kind of crop we get! Yesterday I posted about using recycled materials as gardening containers and today I’m going to put my new know-how to good use. I’m raiding my recycling for plastic bottles. So far I’ve got an old milk carton and an orange juice container; both of which I plan to chop in half, poke holes in, and fill with dirt. Heading to Walmart a bit later for my dirt since everything in the backyard is frozen over and rock solid.